The world's first sporting code to launch its own branded Top-Level Domain (TLD) has continued to flex its innovation muscle with a creative new endeavor. The Australian Football League (AFL) has added www.coffee.afl to its existing line-up of .afl sites. The dedicated website offers fans the chance to buy team branded coffee pods, with proceeds going to support their clubs. 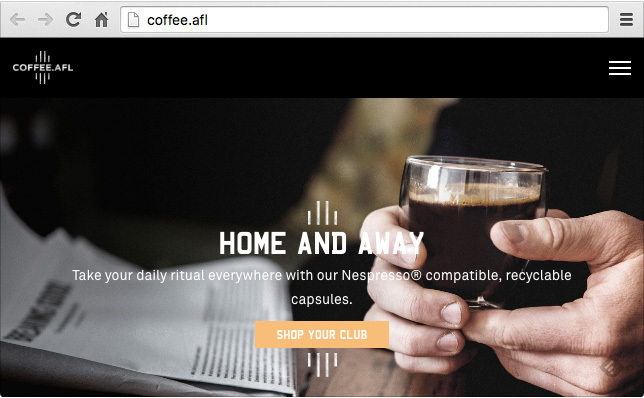 This is not only a creative use of the .afl TLD, it is also something that benefits fans, clubs, a local coffee supplier and most importantly strengthens the AFL's brand as leaders in the digital space. To the best of my knowledge, this is the first time a brand has commercialized its new TLD in such a way. This opens up a whole new world of possibilities for many .brand owners out there looking for ways to maximize the return on their TLD investment. For example, could this pave the way for partnering with sponsors — think 'www.nab.afl' or even 'www.toyota.afl' , some of the AFL's biggest corporate partners. The opportunities are endless, and all it takes is a bit of imagination and some gusto to bring a .brand to life and put it to work. The AFL's approach from the outset has been to use a mixture of different strategies to get the most from its TLD. The site www.play.afl, has a grassroots focus designed to build community engagement in the sport (see related story). There's also www.hospitality.afl with a corporate events focus and www.bounce.afl, targeted at kids through the BOUNCE AFL App, is a vanity redirect. This is in addition to registering and using domains for internal use only, which is helping to build familiarity and internal buy-in. It has been fascinating to watch the AFL use .afl in ways that are both adventurous and just commonsense for such a flexible new digital tool. As the .brand evolution continues to take shape, I look forward to seeing what other brands come up with. Local Time: Tuesday, April 23, 2019 09:07 PM PDT – Page Load: 0.2704 Sec.